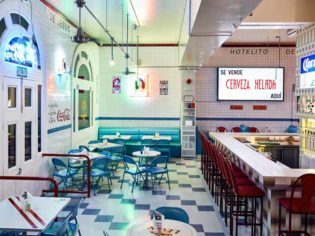 Melbourne design firm, Mash, has lovingly recreated a Mexico City taquería within Hotel Jesus (photo: Tomas Friml). The fiesta comes to Collingwood in a riot of colour and fresh tortilla with the arrival of Hotel Jesus, a cleverly styled taquería that puts you in the heart of Mexico City. A little bit of ’70s-era Mexico has arrived in Melbourne with the opening of Hotel Jesus. 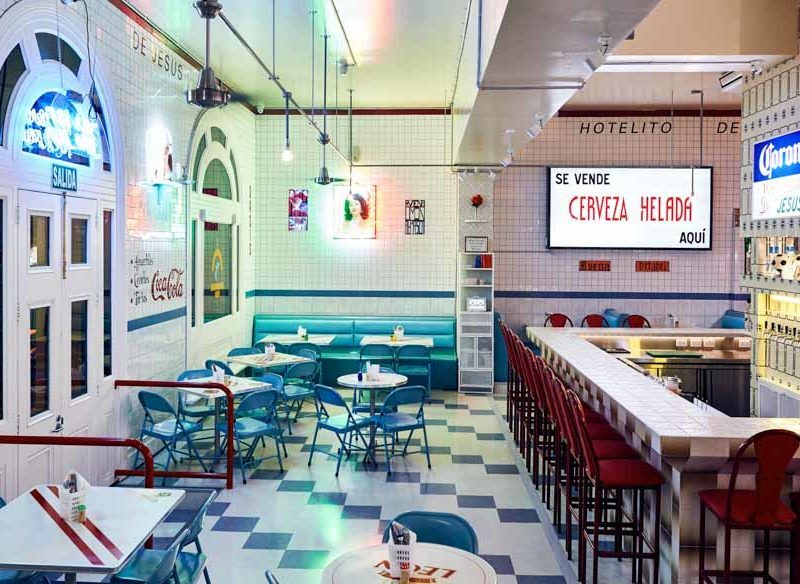 A new offering from the owners of the city’s well-loved Mamasita, Hotel Jesus is a drop-in-drop-out eatery where diners can suspend disbelief momentarily and feel as though they’re in a Mexico City food hall. Resplendent in tiles, adorably tacky plastic flowers, collapsible chairs and Catholic iconography, design studio Mash – the team behind Bali’s Motel Mexicola in Seminyak – has given Hotel Jesus an authentic edge without trying to have the space make sense in its urban setting. It’s fantastically out of place and a riot of fun and fresh flavours. Mash creative director James Brown says he is obsessed with the mercados of Mexico and wanted interiors that felt “more like a movie set or a real lived in place than something out of an architecture magazine”. In the kitchen, Mexican-born Yasser Garcia is making tostadas the genuine way, by dehydrating rather than frying, and you’ll also find an impressive mezcal offering. Dos cervezas, por favor!